A six-foot-five-inch Texan, Leading Petty Officer Luttrell takes us, blow-by-blow, through the brutal training of America’s warrior elite and the relentless rites of passage required by the Navy SEALs. He transports us to a monstrous battle fought in the desolate peaks of Afghanistan, where the beleaguered American team plummeted headlong a thousand feet down a mountain as they fought back through flying shale and rocks. In this rich , moving chronicle of courage, honor, and patriotism, Marcus Luttrell delivers one of the most powerful narratives ever written about modern warfare-and a tribute to his teammates, who made the ultimate sacrifice for their country. It’s difficult to review a book like this. One that made me cry on multiple occasions; one that had me, by turns, awed and inspired; one that followed me the entire time I was reading and since I finished it. Lone Survivor is a difficult book to read; I don’t mean the writing or the style, I mean the subject matter. Going in, the reader knows they are in for an incredible loss, a terrifying ordeal, and, in many ways, an unhappy ending. But they also know that one man made it out alive to tell the story. I read this book after watching the movie of the same name. I struggle with saying that I liked the movie, given the subject matter, but I did like it. I thought it was moving, powerful, and inspirational. While essentially the same story, the book is quite different from the film. The overall story arc is the same, of course, but the differences are in the details. And, as much as I love Mark Wahlberg (because I do) and admire the movie (because I do) neither hold a candle to the book by the real-life hero, Marcus Luttrell. Lone Survivor is more than the story of Operation Redwing; Marcus goes back to the roots of his desire to be a Navy SEAL and the grueling training required to become one. It was fascinated . . . and horrified. More than that, I found myself admiring the commitment and dedication displayed by all members of the U.S. Armed Forces. The expectations are so high and I can clearly see why so few make it to become SEALs; I know I wouldn’t have it in me and that makes me all the more thankful for the men and women who do have it in them. I worried that I would be lost in the battlefield explanations, but Marcus tells about the events of Operation Redwing in accessible terms and I could easily follow the narrative. His writing, overall, is conversational and I could almost hear his voice saying some of the passages as I read. Sometimes I find it hard to “judge” a nonfiction book. Who am I to evaluate how any person writes his or her autobiography? 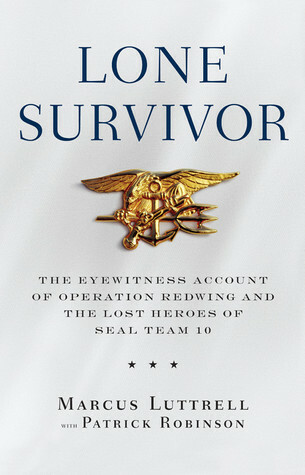 But with Lone Survivor I can easily say that this is one of my all-time favorite books. One that I wish I hadn’t checked out of the library because I don’t want to return it. One that I will get for myself in the very near future, I’m sure. It’s a powerful story about more than a military operation – it’s about the power of teamwork, the lasting impact of friendship, the haunting nature of loss and trauma, and, ultimately, the triumph of the human spirit.